Far north in the night sky, a faint glow appears on the horizon. Green and red flames of light stretch across the sky. A glowing curtain of light forms, waving and swirling above you. As the lights fade away the dark night closes over you once again. This site will show you what auroras look like on Earth and from space, explain how they are created, and show you where they can be found. Teach yourself using the "Self-Guided Lesson" button. What are auroras? What do they look like?What makes them happen? Where can you see them? An illustrated journey that attempts to answer these questions and more! 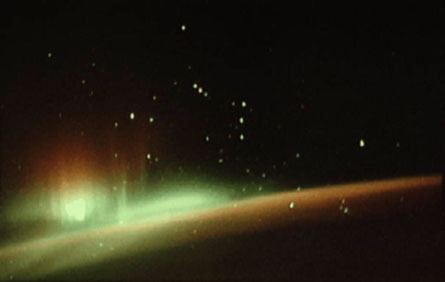 A collection of aurora links, including sites on auroras, the Sun and the Earth's magnetosphere. Teacher's Page Some ideas for classroom use. Also, the place to post your comments or suggestions about "Auroras: Paintings in the Sky."